If you’ve been following me on the blog of social media for any length of time, you probably know that I am a huge proponent of getting runners to do yoga. Yoga has helped me immensely in my own running training. I fully credit yoga for helping me get to my PRs, PDRs, and even for helping me get through difficult training runs. It’s really transformed my life, inside and outside of running. That’s why one of my big goals is to help other runners see the benefits of yoga, too. 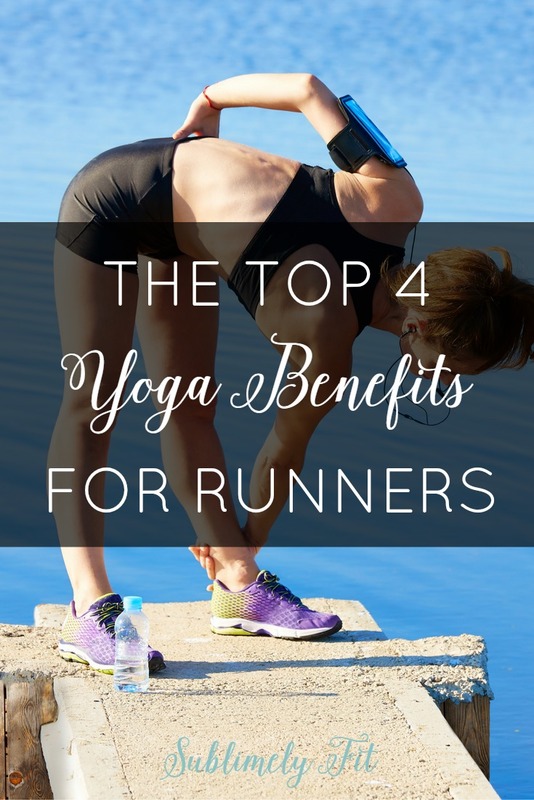 So, today I want to share my top 4 yoga benefits for runners with you. Runners who aren’t yet practicing yoga, I hope this post will convince you to at least give it a try. I truly believe that if you commit to consistently practicing yoga for a month, it really will change you as a runner and as a human. And, if at the end of the month you totally hate it, well, you never have to look at your yoga mat again. Having a strong body is incredibly important for runners. Strong muscles not only help you run faster and for longer distances, but they also help you keep good running form. Even the elites strength train, because they know how important it is to build strong muscles throughout their bodies. One of the beautiful things about yoga is that you do build strength while also getting a lot of other benefits too. Multitasking at its finest. It’s particularly important to make sure that you strengthen the muscles that stabilize your body as you run, particularly the stabilizers in your hips and your feet and ankles. When all you do is run, your body gets used to going in a forward plane, which easily leads to weakness in the stabilizers. Yoga will help you strengthen those stabilizing muscles, which will dramatically reduce your risk of getting an injury that could sideline you for weeks or even months. Speaking of injury prevention, increasing your flexibility can help prevent injuries, too. I’m sure you’ve experienced this: you go on a tough run, then come home and sit on the couch for a few hours. (Hello, Netflix marathon.) When you go to get up, your muscles feel incredibly tight. Your muscles naturally tighten up quite a bit after your runs, often even if you do some quick stretching after your runs. The problem starts when that muscle tightness starts to impact your range of motion, particularly when one side of your body is tighter than the other. You can start to favor one side of your body more than the other, leading to more pressure on the muscles and joints on one side, which can quickly lead to injury. And, if you’re so tight that your body can’t move through it’s full range of motion, you may not be running as efficiently as you could, too. A consistent yoga practice will help you build flexibility. And, a yoga practice designed for runners will help you focus on those problem common areas like the hips and lower legs. Not only will your range of motion improve, but you’ll also just feel better and less sore because your muscles aren’t as tight. Another one of the big yoga benefits for runners is learning how to control your breathing. I’m pretty sure every runner knows just how important breathing is while running. Have you ever had a bad run where you feel like you’re working harder than you should be? Your breath starts to get shallow, then your body tenses up, and all of a sudden you’re miserable and you just want the run to be over. In that situation, if you were to focus on controlling your breath, taking deep inhales and exhales, it very quickly allows the rest of your body to relax. You can’t control the terrain you’re running on, and you can’t control the weather, but you can control your breath. Learning to control your breath during your yoga practice, something we call Pranayama, is a skill you can take with you on the road, too. In fact, several of my clients and students have run personal distance records and PR races thanks to the breathing skills they learned through yoga. A lot of people associate yoga with meditation, and with good reason. Meditation is a big component of yoga. But, if you think meditation is all about chanting and humming, you’re wrong. At its core, meditation is really about controlling your thoughts. You learn how to turn off the thoughts that tend to scroll through our brains when we’re sitting or just going about our days. In yoga, we learn how to let go of any thoughts about what our pose looks like compared to our neighbors’, or even just letting go of the day’s to-do list. We learn to clear our minds to help us be in the present moment. This type of mental control is incredibly beneficial for runners. If you’re like me, you’ve had tough, maybe even terrible runs, where all you can think about is how bad you feel or how much faster you should be running. What would happen if you could turn off those thoughts? You’ll stop sabotaging yourself, mentally, and you’ll become a better runner for it. The mental skills you get on the mat will help you become a better runner. If you’re ready to give yoga a try but you’re not quite up for heading to a yoga studio just yet, my four week Yoga for Runners Online Program is perfect for you. You’ll get many videos with yoga sequences specifically designed for runners to target common trouble areas like the hips and lower legs. You’ll also learn how to use breath and mental control to push through difficult runs. And, you’ll get support as you start to learn how to incorporate yoga into your running training plan. Click here to learn more about the Yoga for Runners Online Program. Totally totally agree! Every runner needs yoga in their life!! Are you a busy mom with no time for fitness? Try these super easy yoga poses that you can do at home for improved emotional and physical health.